Is it just a glorified plank with roller skate wheels on it? Or is it a highly engineered device through which kids have reclaimed the urban landscape, bringing creativity and style back to the sterile asphalt spaces of sprawl? The basic elements of the skateboard seem pretty straightforward. 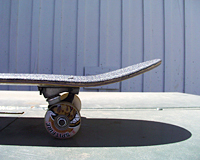 A board has three parts: the board or deck, the wheels, and the trucks, which connect the wheels to the board, and allow the board to turn. But how do you get from this relatively simple mechanism to the perfectly balanced vehicle, the tool for endless creativity on the ramps and streets? We talked to two of the leaders in the design and production of skateboards, Tim Piumarta of NHS Inc., and Fausto Vitello of the Ermico Foundry, manufacturers of Independent Trucks, to find out about the mixture of industrial science and "feel" that goes into a great board. Plank, Deck, or Board: Whatever you call it, wood is the thing. "Modern skateboards are made traditionally from 7 plies of sugar maple veneers, pressed together using polyvinyl glues in either aluminum, metal or concrete forms, generally taking around 300 psi to take up multiple skateboards in one closing of a press. Anywhere from 3-5 skateboards are done in one press, and after 30 minutes to an hour, the boards are removed from the press. At this point they have been stuck and laminated in the compound curve or the shape, which is the concave. Then after days of curing, the CNC routers, or hand routers depending on the woodshop, will cut out the final shape, apply the edge trimming, paint it and send it on its way." Why maple wood? Piumarta described the unique characteristics of wood. "With all the alternate materials we've tried, from epoxy and fiberglass to carbon loaded thermoplastic nylon, nothing has had the combination of toughness, elasticity, feel and response of laminated sugar maple board." Piumarta was one of the first designers to put concave curves into boards in the early 1980's, and developed the first upturned nose. When skaters refer to "concave" they are talking about the way that the board curves up at its edges, nose and tail. This curvature both strengthens the board and gives the rider more control of the board. "There's two shapes you talk about when you look at performance: of a skateboard: number one is the concave, the 3-dimensional curves that are in the board itself, nose, tail and side to side concave. Every manufacturer has their own style or philosophy. Mine is based on actual functionality; what your foot feels like when it's in the concave itself. To get there, I do a lot of prototyping in foam cutting, letting all of our pro and amateur riders have a say in what feels good and what works before we go and cut tooling to make skateboards. So our approach is based on a feel functionality first, and then secondly, when no one's looking, I slip in curves and bends engineered into this 3-d curve, the concave, that makes the board stiffer, stronger, and makes it last longer." The other shape is called the plan form. This is the shape of the board's outline; if you put a board flat up against the wall and traced its outline, you would be drawing the plan form. According to Piumarta, this shape is largely determined by the choices of individual riders. "Now the other shape we're talking about is the plan form, or the shape outline of the board of looking at a wall. Pro riders can tell by looking and feeling with their hand, they can tell if a board is out of shape by even fifty thousandths of an inch. They can feel it, they know what they like, and what they don't like." And, as Piumarta says, all the engineering in the world means nothing if it doesn't result in a good ride.